Keeps drinks cold for 24 hours and hot for 3 hours! Stainless steel double wall construction to keep beverage hot or cold. Set comes packaged in retail-style box. 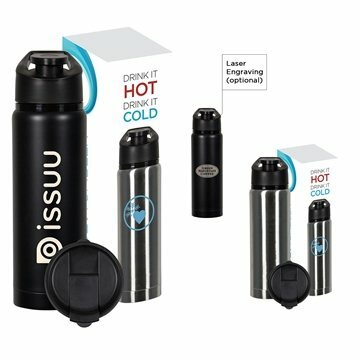 Includes flip-to-open lid for hot drinks and snap-top lid for cold drinks. Sharply presented high gloss tumbler. We loved them and turned out exactly how they were planned and shipped on time. The sales rep was awesome too! Everyone loved them. the quality of the imprinted logo. There where no surprises with this particular item. the presentation of the product was very good.